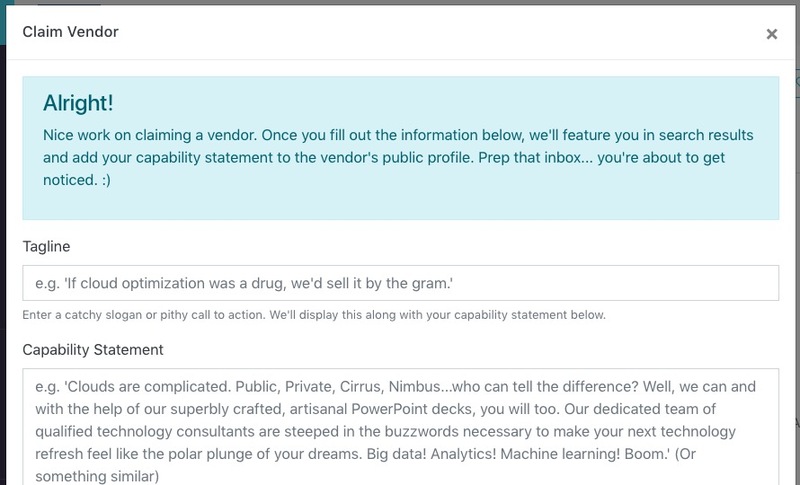 Standard and Premium plan users are able to "Claim" their vendor profile on GovTribe, and add some additional marketing content to it. We will then "Feature" (i.e. promote to the top of the page) your profile on the Vendor search page in the context of the search being performed. This article explains the why and the how of this capability. GovTribe's primary user base is companies who are interested in federal contracting or grant-making. However, we are also visited by about 10,000 government users every month! Through polling of our government users, we've learned that they are mostly contracting officers and other procurement specialists, using GovTribe to research companies when preparing new procurements (among other things). Specifically, government procurement personnel use GovTribe to research companies that are eligible for certain set-asides, that have access to contracting vehicles, and that have the capabilities and past experience that match their current needs. This kind of research helps inform if a bid comes out as a 8(a) or VOSB set-aside. If a contract can be sole-sourced or if it should be bid competitively. As an example, let's say a contracting officer from Homeland Security is preparing to procure cyber training services and she wants to know if there are enough qualified small businesses to bid it as a small business set-aside. That CO goes to our Federal Vendor search page and sets up a query to look for all small businesses that have experience providing training services (NAICS 611) related to cyber security across DOD and civilian agencies. At the top of the search results are featured GovTribe customers with their capabilities statements and contract history front and center. 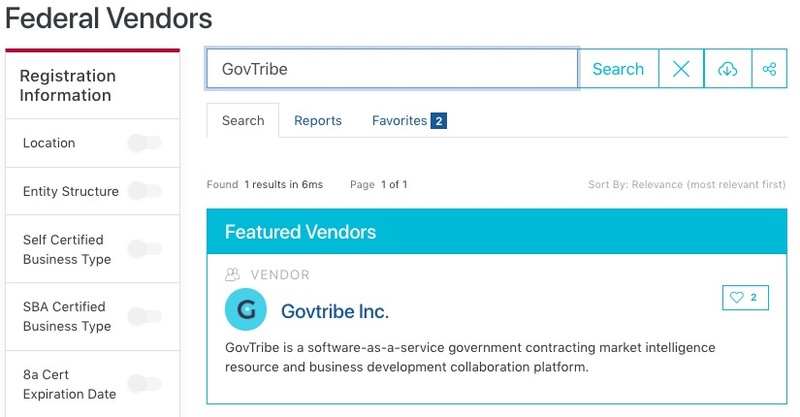 It's worth noting that many companies also perform vendor research on GovTribe when searching for teaming partners. The use case is very similar. 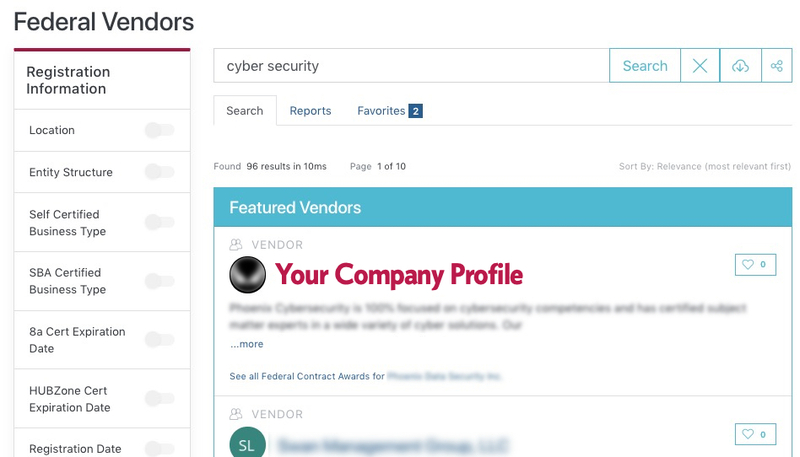 To claim your profile, first go to the Federal Vendor search page and search for your company by name. Click on your company name to view the profile. In the upper right corner, click the Claim Vendor button. A short wizard will launch to guide you through completing some marketing information about your company. Complete the wizard and confirm that you'd like to publish. Once confirmed your vendor will be featured! Give it a try by going back to the search page and searching for your company name.